Chelsea manager Maurizio Sarri has questioned Alvaro Morata’s mental strength despite the striker scoring twice against Crystal Palace in the team’s 3-1 victory on Sunday afternoon. “Alvaro improved [in] the last month. Improved for the confidence, improved for the personality, improved also from the technical point of view. Now he’s able to play more with the team, I think. But I think, also, that Alvaro has a very great physical and technical potential, so I think he can improve more. When a striker puts in an influential performance and scores twice on the pitch, there is little to criticise. 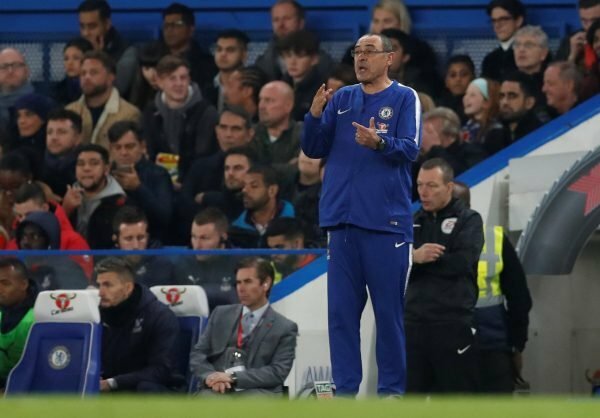 Sarri justifiably praised Morata for his contribution in the victory at Stamford Bridge, which extended the Blues’ unbeaten run to 16 games in all competitions. However, insisting that the forward can still make improvements to his game suggests that the manager is not entirely satisfied with the striker this season. That is no big surprise given that the forward, who is valued at £54m by Transfermarkt, had only netted three goals in nine Premier League outings. His two goals against Palace, though, means that the Spaniard is finally finding form having netted five in his last six games in all competitions. The interesting comment from Sarri relates to Morata’s mental state, and labelling a player as “fragile” in the media can sometimes have adverse effects. In some ways perhaps the Italian coach was issuing a warning to the striker, suggesting that he needs to be mentality tough in order to cement first choice. Should Chelsea rule out striker hunt? It is a welcome sight to everyone associated with the West London outfit to see Morata back to firing form. However, the former Real Madrid star has had positive spells in the past, but consistency has been lacking. Sarri’s comments suggest that he wants more from the Spaniard, and the period from now until the January transfer window opens will be crucial for Morata and his teammate Olivier Giroud. For the majority of the season so far, goals have come from midfield and wide areas for Chelsea. Morata and Giroud’s lacklustre efforts have been a concern, but not so much of an issue considering that the Blues continue to get the results that they need. Even though Morata is finding form, Sarri must not rule out bringing in a proven goalscorer if one is available in January.